Tsunami of human need and dysfunction. That about describes my day to day environment at my job. I have applied for a transfer, to two different places. If you are of a mind to, please light a candle, send energy, or pray that one of these places deems me worthy of employment. I never thought I would see the day that I would be afraid that I would lose my license because of decisions on staffing made by administration, people who don’t work the line and have no concept of the difficulties a line nurse faces. The words completely overwhelmed, unbelievably fatigued, and frightened, about accurately describe my feelings. My syllabus for my capstone course states that approximately an hour a day will be enough to complete all of the modules of the research paper. Hah! Liars! Either that or I’m simply too compulsive in wanting to get this thing done well. Thirty hours last week, another 20 hours this week, and another three weeks to go…with working and everything else in my life continuing as usual. Done with this week’s work, submitted with three hours and ten minutes to spare; tomorrow starts the new week’s work. I sincerely hope it will involve somewhere closer to their estimates of time. Mr. TF and I have been stressed for most of the year, thinking we were going to owe tax money even though we’ve earned significantly less money this year than last (Mr. TF lost his full time job in 2009 and has only been working part time this past year). Our property taxes went up even though our valuation went down, why wouldn’t our income taxes go up even though our income went down? Well, well, well. As Gomer used to say, “surprise, surprise, surprise!” We are getting a refund. Of course, it’s mainly because we’re both in school and got to deduct our school expenses. Yay, a wood stove is definitely in my future now! The tax refund will go for that! Woo Hoo! Post on the Arizona failure to pass the hsoptial levy plan coming soon. Let’s just say that it isn’t going to be pretty economically here in this state soon. I gotta get my 5000 word research paper done before I can work on a series of postings on my state. Although luckily a lot of the research stuff will apply. 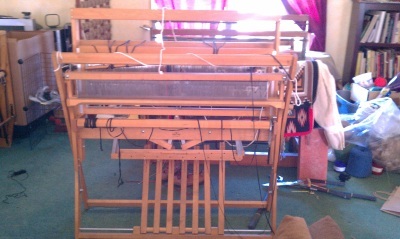 This is my newest loom, it’s a 4 harness 36 inch weaving width Schact folding loom. I got it for an insane price, and couldn’t pass it up. It *does* need work, but can weave just as it is. The bags of yarn you see next to the larger loom in the background are my take from the annual silent auction — much of that is cotton chenille and will become new towels and washcloths. Some is linen and will become napkins and table cloths; I prefer to learn on stuff I get for next to nothing so that I am not paralyzed by the fear of making mistakes. The rest is wool of various weights; some will work for rugs if I weave them with the plan that they get felted into smaller, tighter packages. The rest will become scarves, pillow tops, and samplers for various weaving patterns. There are also two large boxes of coffee stuff that belong to the Guild; I hostessed last month and the normal hostess wasn’t there, so I still have it until next meeting. It’s out because at first it wasn’t really in the way, but with the new loom the amount of space is rather…small and crowded. It has to go to someone else for this next meeting, even if the normal hostess isn’t there — I work for the next meeting and won’t be there. The larger loom in the background will go to a new home, if my friend still wants it — I got it for free, basically, so I’m passing it along. It isn’t what I had hoped, and it needs to go to a new home soon. I wanted to weave a few rag rugs on it, but I really could use the room, and I can still make braided rag rugs. My little folding loom, my first one, the gateway drug into the weaving addiction, is staying. It’s perfect to take to classes and workshops. And for sampling. I can’t wait to actually get caught up on outstanding projects and warp my new loom up! I feel like I did when I was pregnant and I was just counting down the days until my due date…I am done with my last class for my bachelor’s degree in five weeks. I graduate in FIVE WEEKS!!!!! I am definitely going back for my master’s…as soon as I take the summer off. I need a break. I’ve been in school non stop, year round other than a two week break at Christmas, for well over a year. I’ve earned a summer of lazing around, doing nothing but working my normal two jobs, gardening, canning, catching up on spinning and weaving. I plan to spend MUCH less time in front of a computer screen, and much MORE time doing yoga and other things that make me feel relaxed and happy.